TBWA, a global advertising company who works with Nissan, Apple and more, and Hakuhodo, Japans 2nd largest agency who works with Nissan globally, decided to come together and establish a joint venture in Tokyo known as TBWA\HAKUHODO. TBWA\HAKUHODO teamed up with Klein Dytham architecture and found an old bowling alley in a large 8-story amusement complex in downtown Tokyo. The amusement complex is still in use actually with a bowling alley and a golf driving range above and below their headquarters. The site they chose to house their headquarters would be considered a bit unconventional for most, but it fits perfectly with the company’s philosophy of disruption. They figured their location would be a wonderful way to disrupt their clients’ expectations when they visit the space, suggesting that the agency ʻthinks differentʼ even for themselves! The long, column-free space provided some incredible design opportunities. Rather than negating the original use of the space, KDa embraced the linearity of the architecture and designed the office layout in conjunction with the predefined alleys. The most delightful feature of the office space is the design of the whimsical project rooms, meeting rooms and directors’ offices. They emerge from the wooden floor like small grassy knolls covered in soft moss. The shelters are also accessible from the top, allowing for casual and pleasant break spaces. 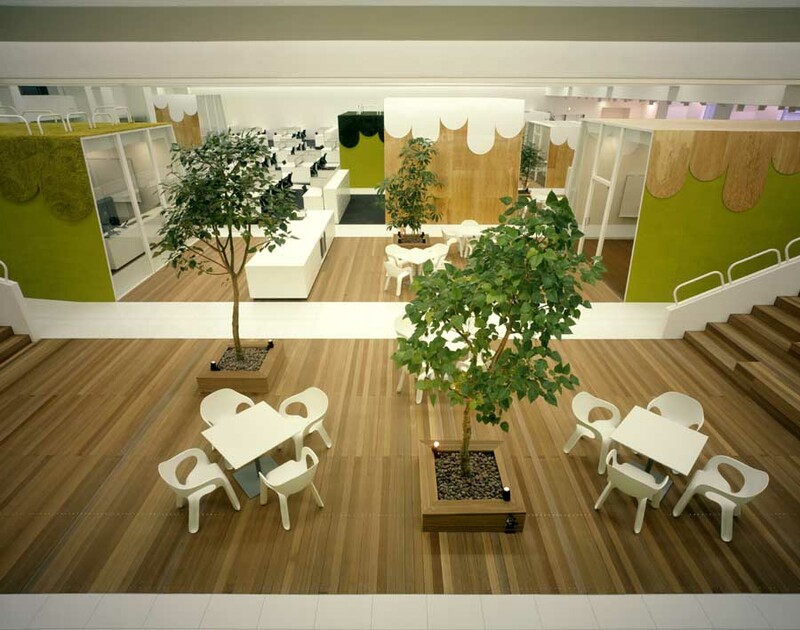 The use of trees, exterior furniture, materials and forms that reference nature gives the space an amiable atmosphere. The design engages employees and visitors in spontaneous interaction within a relaxed and welcoming environment.